Anyone who has kids, or who has spent time with them has quickly found out one of the truths of life: Kids are the fiercest food critics. A combination of a not-so-refined taste, and the honesty of a drunkard can break anyone’s heart. Imagine my surprise when my daughter showered praise on this Christmas Carrot Cake. This isn’t as common as you’d think. For reasons I have a hard time understanding (ahem! ), I’m always assigned cooking duty when my daughter’s class has a party. I’m only assigned cups or plates when I rebel. The strange thing is that I’m not sure why the kids haven’t rebelled against my cooking. None of my dishes have been well received in Nadia’s class. My worst experience this far has to have been the time I made pizza for her class of preschoolers — what was I thinking?! My pride demanded I make pizza from scratch, none of the store-bought stuff reheated the next day, no. I woke up at 5 AM to start my dough, authentic Italian flour and recipe at hand, new fancy gadgets, tomato sauce from fresh tomatoes, fresh herbs, the best mozarella available in stores. It was going to be a thing of legends. And it was: no kid other than my daughter — pity perhaps? — touched the darn thing. At least the teachers liked it. You’d think I’d have learned my lesson after that, and you’d be wrong. Another such incident occurred when I made an apple pie for her class (the teacher chose the dish). I got rave reviews from my daughter’s American teachers, the little philistines didn’t even touch them. The loved the store-bought cupcakes though. Nothing like a kid to deflate your ego. This is not the classic carrot cake, although nearly all the ingredients are the same. I’ve added a few touches that to me speak of Christmas: spices, ginger — I may have a tiny obsession with ginger — and cranberries. The cream cheese filling does not contain butter, and is made with low-fat cream cheese. The addition of brown sugar gives it a lovely caramel color and a richer flavor. I am sure you’ll love it, after all, it already passed the little critic’s test. 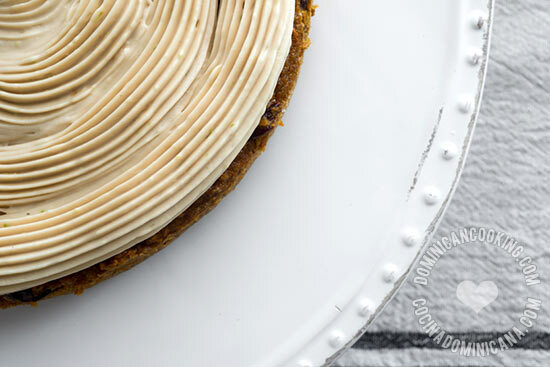 Christmas Carrot Cake Recipe: There's the classic carrot cake, and this spiced wonder. It doesn't hurt that is also pretty low-fat. Grease two 8" [20 cm] round baking pans. Dust with flour and turn to get rid of the excess flour. Mix the remaining ingredients very well. Pour half into each baking pan. Bake until you insert a skewer or knife and it comes out clean (25-30 mins). Whip all the ingredients with the paddle attachment of the mixer until all the brown sugar has dissolved (5-7 mins). Pour into a decorating bag with a big tip. 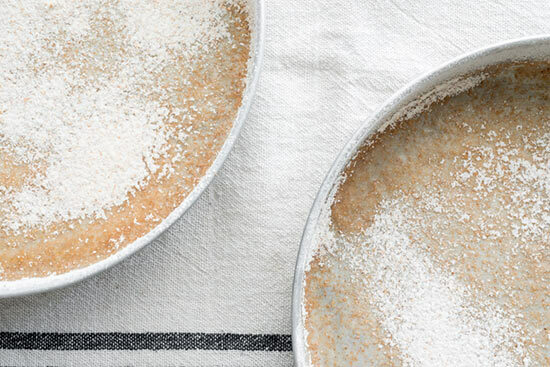 Make concentric circles on one of the cakes until you have an even layer of filling. Cover with the other cake and serve. This looks amazing. This is one of my favorite christmas desserts so I’ll definitely have to try this!